In Walt Disney's BAMBI, the rabbit Thumper quotes his father as saying, “If you can't say something nice, don't say nothin' at all.” If Thumper's dad were reviewing THE LAZARUS EFFECT, it would probably be one sentence: “THE LAZARUS EFFECT is less than an hour and a half long.” At least that's the only nice thing I can find to say about it. Of course film critics have never been the sort to take the advice of Thumper's dad to heart, so I'll elaborate further. 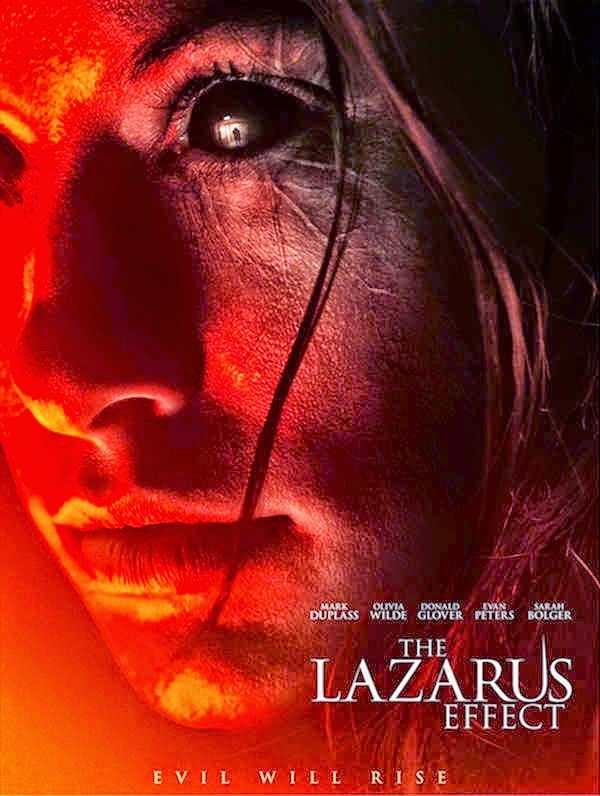 Directed by David Gelb from a script credited to Luke Dawson and Jeremy Slater, THE LAZARUS EFFECT plays like a horror movie riff on last year's Scarlett Johansson actioner LUCY. Frank (Mark Duplass) and Zoe (Olivia Wilde) head up a small research group, with fellow scientists Niko (Donald Glover) and Clay (Evan Peters) working under them. Student filmmaker Eva (Sarah Bolger) is also around documenting their experiments. The goal is ostensibly to find a way to keep patients alive on the operating table longer, but the experiments have slipped more into ghoulish Dr. Frankenstein/Herbert West territory. After initial success resurrecting animal subjects, albeit with some troubling side effects, an accident that leaves Zoe dead forces the team to move on to human trials with predictably disastrous results. Zoe comes back with all manner of psychic powers (explained with a variation on the bogus “we only use 10 percent of our brains” myth also used in LUCY) and a bad attitude, compounded by a heavy dose of guilt over a tragedy she witnessed as a child. Now no one – friends, lovers, or co-workers – is safe from Zoe's wrath. Even beyond its blandness and lack of originality, there are numerous problems with the film's story. This is a film that seems to delight in bringing up subplots only to abandon them or let them fizzle out with no real impact. Zoe and Frank are engaged, but their research has pushed the wedding back. This is brought up like it should be a fairly major theme, but only barely pays off later. Then there's the allusion to a past romance between Zoe and Niko which winds up serving no real purpose. And Ray Wise pops up for maybe two minutes as an evil CEO who uses a clause in the team's contract with the university to gain possession of their research, never to be seen again. Beyond the basic story problems, director Gelb (whose last film was the documentary JIRO DREAMS OF SUSHI) shows absolutely no affinity for the material. His shots are bland and uninspired, completely lacking in style. There's neither a sense of fun or of genuine horror to the proceedings, either. Just deadpan seriousness that the threadbare story doesn't warrant. And talk about your unsatisfying conclusions. There's nothing inherently wrong with a fake-out ending in a horror movie, but in this case it's completely unearned and unfair. Not to mention it sets up the most unwelcome prospect of a sequel. 1 out of 4 stars. So low-grade horror is where the director of JIRO DREAMS OF SUSHI went? Ohellno! This sounds like the sort of movie I would get assigned, back in the days newspapers actually paid me to freelance-review movies on which the better-liked critics didn't want to waste their time. At least I had the illusion of a career. What was the rest of the audience's excuse? The trailers and clips from this actually made it look pretty decent, and the high profile cast made me want to check this out. The quality of the cast is one of the other few "nice" things I could say about the film. They deserved better.